"Fans of the storytelling series the Moth who watched the “Girls” season finale on Sunday night were likely pleased to see some of its heroes, including Ophira Eisenberg and Adam Wade, interact with Hannah Horvath. “No notes!” Wade tells Hannah as she’s about to go onstage at Housing Works. “What are you, an idiot? You’ll be disqualified!” If you know his work, this exchange is funny for a couple of reasons. One, Wade is a good choice to vocalize “No notes,” one of the key tenets of Moth-dom—he’s won the Moth Story Slam twenty times. Two, the reason he’s so successful is that his stories embody another, unspoken tenet of the Moth: heart." "Mr. Wade, a 20-time winner of Moth storytelling competitions, is one of the most popular spinners of yarns in New York City, with a knack for heart-rending but cautiously optimistic tales." Comedy Pick of the Week"
"Mr. Wade is an enchanting storyteller." "Ladies, please do not go to this show if you are currently seeking someone to love. Because Adam Wade will become that person. Sweet, despairingly honest, and just so damned FIXABLE, we assume Wade is the personal project of at least a dozen hot East Village poet-sculptors. Want to get in line behind them? Be our guest." "An adorable, compelling and hilarious storyteller and a guy with a captivating New Hampshire accent. As funny as his tales are, they don’t really include jokes. Rather, he’s simply 100 percent honest. When he relays his efforts to be cool in high school or get girls in college, or do either today, the crowd is also laughing at itself. You can't not like him." 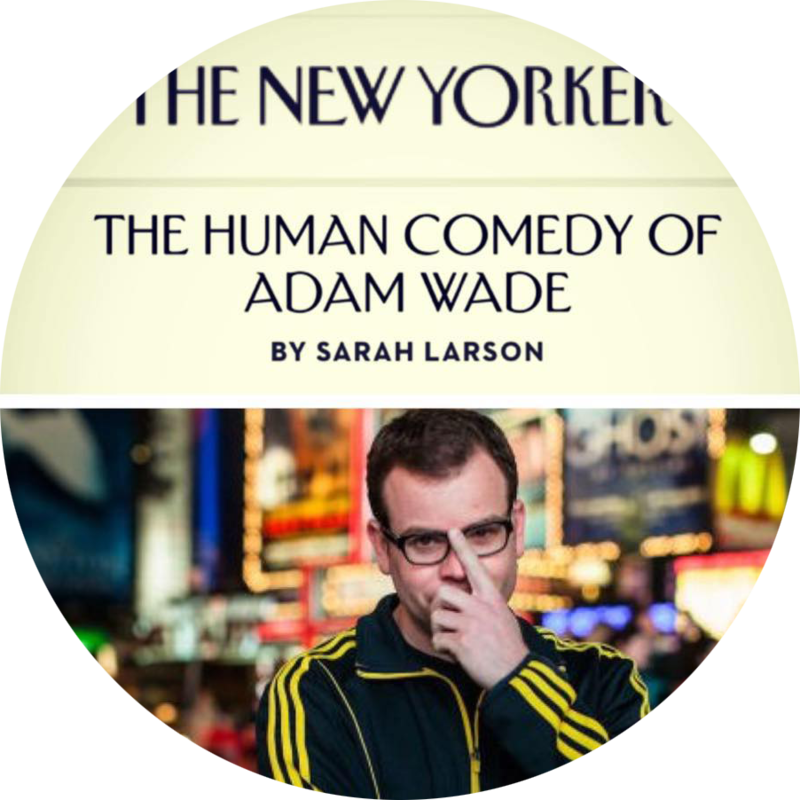 Hoboken storyteller/comedian Adam Wade appears on 'Girls' season finale, and gets profiled in New Yorker"